I am obsessed with makeup brushes; they are the tools of my trade, and I truly and deeply appreciate the craftsmanship behind well made brushes. I primarily use Hakuhodo, Chikuhodo, and Kevyn Aucoin brushes, and once I saw Rae's magnetic collection, I knew I had to have them. You know what? She did just that with these brushes. In this set you get the Deluxe and Mini Kabuki, The Ultimate Cheekbone, the Square Kabuki, and the Flawless Shader. The brush pictured on the farthest left is her Radiance brush, and the shadow brush #11 on the far right does not come with this set. I also purchased the Rae Plate, the Magnetic Kabuki and Radiance holders which are also sold separately. 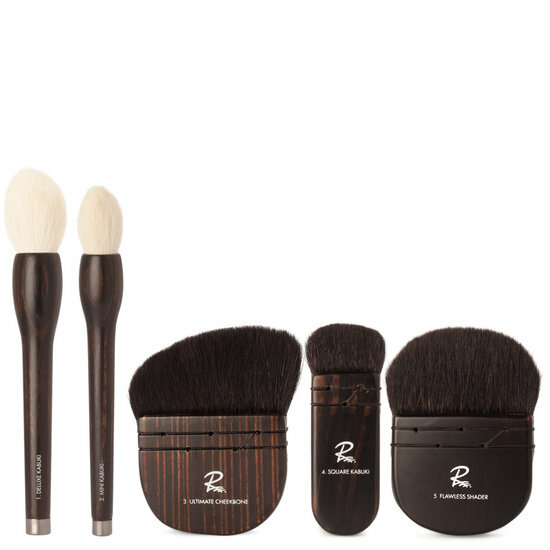 The Deluxe and Mini Kabuki brushes are comprised of goat bristle. They are shaped beautifully and are surprisingly dense, and because of the type of bristle paired with the density of the brushes, you will get medium to heavy product pick up and deposit. They produce just beautiful washes of color in the most efficient manner. Both brushes are multifunctional as well: You can use them to apply powder and cream products: Bronzer, blushes, and with the right amount of pressure applied on the correct angle, they can also be used to contour, highlight and blend. 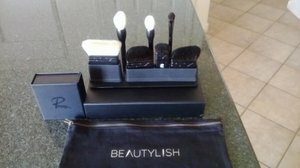 The key here is not to be heavy handed and press or jam these brushes to either the product or the skin; they will do the work for you. My favorite brush in this collection is the Ultimate Cheekbone. With this brush you can contour and shade with powder products. You can really pop the cheekbones by coming directly under the cheekbone, and you don't have to coat the entire brush with product..you can kind of flick or pop the brush in a slight upwards motion, and then change the angle and swipe the brush through the temple. The simple motions one makes with this brush can really pop the bone structure. The Flawless Shader is a crescent shaped brush that can be used to define the jaw line, apply and blend bronzer, and it would make a great finishing brush as well because it can be moved in a small circles to buff and blend by holding the top edge of the crescent to the skin. The Square Kabuki.... Makes a great under eye brush. You can use it to blend concealer, contour, and this brush will take any hard edges off any product lines on the face. They key to this brush....don't move it in circular motions, you want to move it vertically or side to side. I LOVE this Kabuki set as much as I love my Wayne Goss, Chikuhodo, Suqqu brushes, etc! The bristles are soft but more importantly this set is truly functional. My fav brush is the slanted contour brush. This brush is a dream when applying contour. You apply the contour powder to the shorter bristles and let the longer bristles blend the contour. The brush picks up the right amount of powder. I love it. The other similar brush is amazing as well for blending. I love both the white goat hair brushes. They are a bit denser than my Chikuhodo and Goss brushes and now I have more variety of densities to choose from without losing the softness. The small Kabuki brush is cute...but I haven't found any way to use it that I feel is functional. For the price point, I think this set is a steal. Rae Morris knocked it out of the park with this set of brushes!!! I am very pleased with these brushes. They are a bit pricey, but so worth it. They are so soft and really do what they are supposed to do. All the brushes are amazing however I unexpectedly fell in love with the two kabuki brushes. My blush application is on another level now that I am using the larger kabuki brush and the smaller one is perfect for highligting.